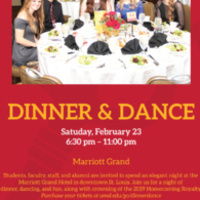 Students, faculty, staff, and alumni are invited to spend an elegant night at the Marriott Grand Hotel in downtown St. Louis. A three course meal will be included with the price of your ticket. Join us for a night of dinner, dancing, and fun, along with crowning of the 2019 Homecoming Royalty.